Do you still take two lumps in your stinky? I mean, your coffee? 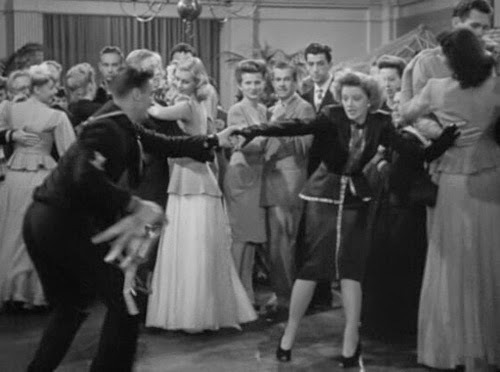 The penultimate Thin Man movie arrived after a four-year gap spanning the majority of the US’ involvement in WWII. 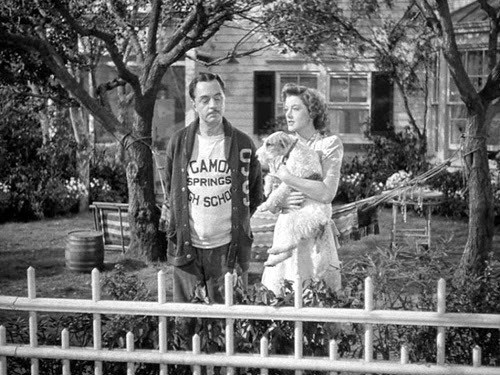 This time Nick (William Powell) and Nora (Myrna Loy) visit the former’s parents in Sycamore Springs. The small-town New England locale is the antithesis of Nick’s preferred fast-living big city comfort zone. The juxtaposition is irresistible, and much fun is had with the couple snooping around a backwater. Slightly awkwardly, since character development wasn’t of great importance previously, the theme of Nick just wanting to please his father is caught lurking on the verges of the plot. Fortunately the interplay between Powell and Loy atones for this; they are as strong as ever, and the picture pulls off some fine comic sequences. Less surefooted is the reveal of the murderer, which, despite some well-devised red herrings, feels like an afterthought. This person (or persons) doesn’t become any more likely a perpetrator (or perpetrators) once Nick has explained their motivation. 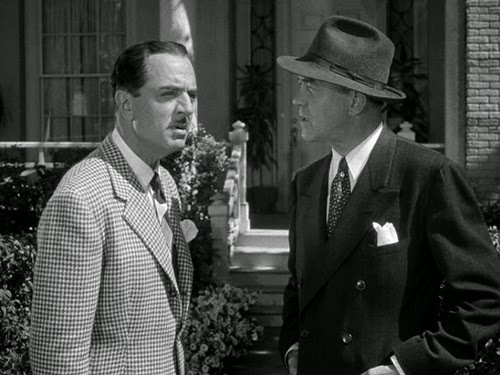 Robert Riskin and Dwight Taylor take screenplay credits (Harry Kurnitz, who contributed to Shadow of the Thin Man, gets a story nod). 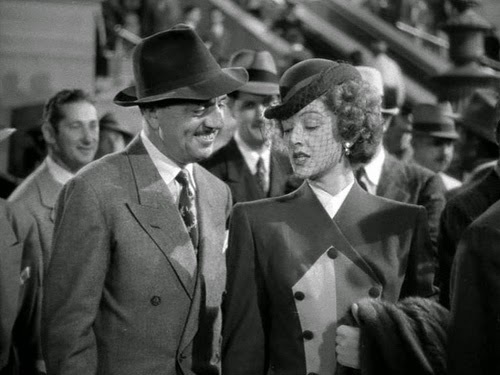 The former worked on a number of Frank Capra pictures (including It Happened One Night and Mr Deeds Goes to Town) while the latter was one of the many wordsmiths who pitched in on Astaire/Rogers musicals Top Hat and The Gay Divorce. While they’re good with the gags, they also stick perhaps a little too devotedly to the murder plot. 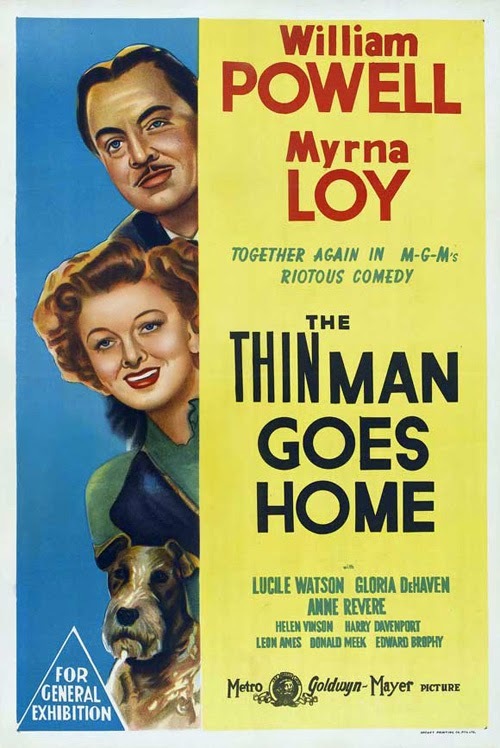 Consequently, The Thin Man Goes Home lacks the sense of borderline anarchy, the feeling that the picture might go off on a complete tangent at any moment, which characterised earlier outings. Nick’s arrival is even acknowledged with a Scooby Doo welcome whereby he is expected to get straight to work solving an unspecified crime (“I dare say there’s plenty of evil in Sycamore Springs, and its your duty to ferret it out”). The plot-first approach is emphasised by the set up. Nick is just visiting home on an off chance? Not really, but the extent to which he is visiting with intent is never made clear. He knows a whole lot about the relationship of the murder victim to one of the townsfolk, which suggests this is at least partly why he fetches up in Sycamore Springs (the murder is presumably not something he expected, but quite possibly the scheme that led to it is), but this in itself puts him on a different footing to the signature reluctant-but-not-really tipsy ‘tec who’d rather sit pretty with his wife’s fortune. 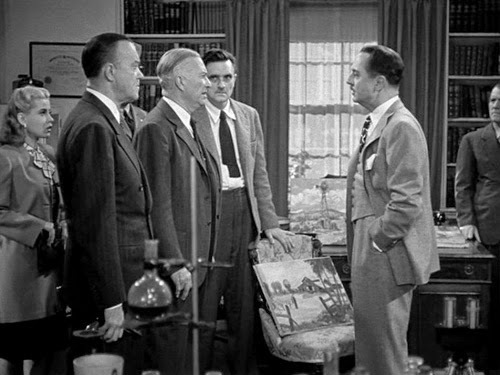 The involvement of Brogan (Edward Brophy, who played a different character in the original) is never fully clarified either; he’s presumably in Nick’s employ, but it isn’t revealed just why he is lurking in the bushes at the time the murder happens (aside from giving Nora reason to get the wrong end of the stick). In any other era we’d suspect he was up to something rather unwholesome, hiding in shrubbery and peering in through windows at night. Perhaps something was excised. The interconnecting relationships in the town are well mapped out (and explained), making the weakness of whodunnit an added disappointment. One can feel the emphasis on plot more consciously this time out, so when it comes up short the effect is more damaging. 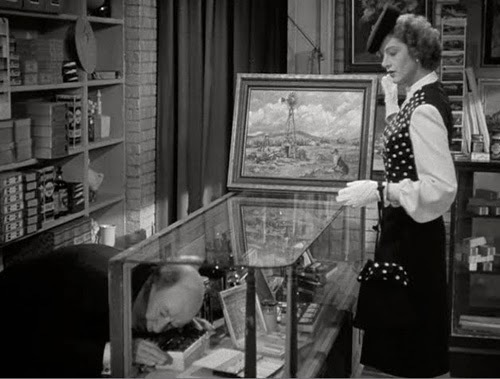 Some of the coincidences are on the clumsy side also (Nora just happening to buy a painting of vital importance to the plot, which admittedly leads to an amusing routine where Nick fails to acknowledge it as a present). There is something approaching slavish devotion to the cute routines by this point too, even if part of the fun comes from the makers recognising this. Nick must lead Nora up the garden path so he can head off alone to do some real detecting, but in doing so she happens across vital information. Her account of Nick’s preferred method for revealing the murderer verges on the meta; asked why they have all been herded into a room she comments “For a very simple reason; this is the way he always works”. 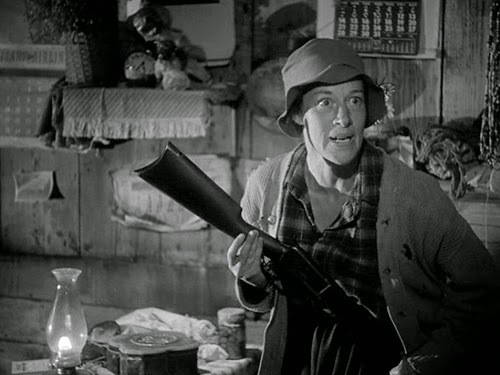 And then there’s her confidence in the likelihood of a gun going off (“That’s the way these things usually end up. It’s called the pay-off. I usually duck under the sofa when it starts”) and undisguised disappointment when everyone is frisked. 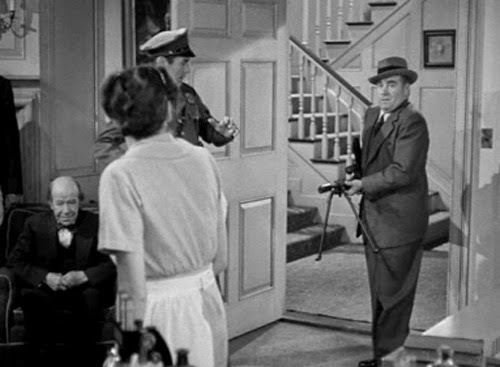 This scene is more exacting exposition-wise than we’re used to, but this serves to make the comic punctuation points more memorable; a musket going off, Brogan arriving with a sniper rifle, mother coming in with an update (“Just keep doing what you’ve been doing. I’ll have the cocoa in a few minutes”). So too, Police Chief MacGregor (Donald MacBride) is basically a reworked Lieutenant Abrams, protesting that he isn’t as dumb as everyone thinks while Nick runs rings around him. Like Abrams, he is granted a smattering of memorable lines. When Nora asks him to arrest Brogan she asks why it has to be for something definite. He deadpans “No, no. You just pick out anybody at all and I’ll put him in jail for life”. Nick: Who’d like some cider? Having Nick switch to cider seems like a betrayal almost as horrific as a 12 certificate Predator/Robocop/Die Hard/Alien. How can a character that is equal parts pickled have his calling card struck from under him? In truth, it doesn’t actually diminish his character (but more could have been made of this than the short-lived gag of everyone thinking he’s soused again when in fact he’s sober), and the notion that cider doesn’t really count as alcohol is amusing, but there is a feeling that Nick is being gradually defanged. It’s a good while since prohibition was repealed, and in the midst (well, towards the end stages) of WWII there was a feeling that perhaps temperance is in order as a reflection of then in force rationing. Surely the movie ought really to have been giving folks something to aspire to; like getting completely blotto? The signs of war aren’t sledgehammered, though. The trains are packed like sardines (complete with a fat chap Nick refers to as Blockbuster). We see a few assorted servicemen, including the one who dances with Nora, and a souvenir Japanese sniper rifle. Even the bigger plot relates only to a non-specific foreign power, albeit the victim works at an aircraft factory. There’s little to announce, if one didn’t know, that this was wartime. Certainly not the way the Rathbone Sherlock Holmes pictures dwelt on the subject. The flirtatious fun is a little more restrained than previously, although there are some memorable moments. There’s Brogan’s assumption that Mrs Charles is only pretending to be Mrs Charles and that Nick is up to his old dog’s tricks. Then we have Nora assuming, in a not really very jealous way, that Nick is smoothing his way with the ladies; finding Nick with Helena Draque (Helen Vinson) out cold on the floor she comments, “Well, you certainly got right down to business”. Unfortunately Laurabelle’s over-dramatic play for Nick fails to result in an encounter between the sleuth and her jealous boyfriend, so it’s the attentions Nora attracts that get more laughs; a crazy dance floor number where a visiting sailor doesn’t let her feet get anywhere near the ground (Powell must content himself with giving good double takes) and a trail of wolf whistles every time she walks through a bar. 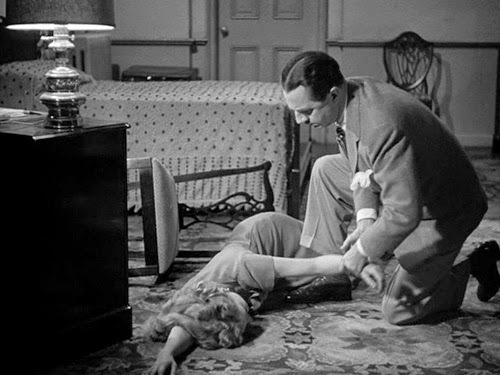 Less commendably, there’s a spanking scene in which Nick puts Nora across his knee. Even in jest, it’s rather uncomfortable to watch. Nora calling him a wife beater fails to alleviate matters, and then dad deals the deathblow when he admiringly comments, “I’ve wanted to do that to mother for 40 years”. More alarmingly still, MGM clearly thought this would be a selling point as the moment is captured in some of the film’s posters. Talking of dad, Harry Davenport’s Bertram Charles isn’t sufficiently authoritarian to sell genuine disappointment in Nick. Aficionados of the book have made much of Nick’s absent Greek background, but I think the only real issue here is turning him into someone who only wants to make daddy proud. It’s a bit too cosy, as the Nick of the original really wouldn’t give two hoots. However, it’s endearing that Nora is itching for something terrible to happen so Nick can solve the case and impress pater (she also gives Nick some free press publicity; “Nick Charles is in town. Nick Charles is a detective. You can draw your own conclusions”). Elsewhere, perhaps to balance things out, the makers seem conscious of some of their past errors and return to the line up of the first two films. There’s no sign of Nick Jr who is consigned to school via a rather dismissive line to Mrs Charles (Lucile Watson, taking the role of the endearing parent who only sees good things in her son). It isn’t clear if his parents have visited Nick in the city before, but they don’t seem to treat Nora as if this is the first time they’ve met. And yet, as doting grandparents, you’d have thought it would be a huge snub not to bring the little urchin along. Perhaps the producers thought better of the inclusion of Nick Jr (if so, he surely wouldn’t have return for the final film in the series), although I’m the first to admit he very surprisingly didn’t damage the previous two pictures; a six or seven year old junior might be precocious to an unwelcome degree, though. The supporting cast isn’t quite as merry as it has been but there are a few genuine oddballs and quirks. Brogan’s penchant for quoting Tennyson. Donald Meek as the overly literal gallery owner who can’t understand Nick’s colloquialisms. 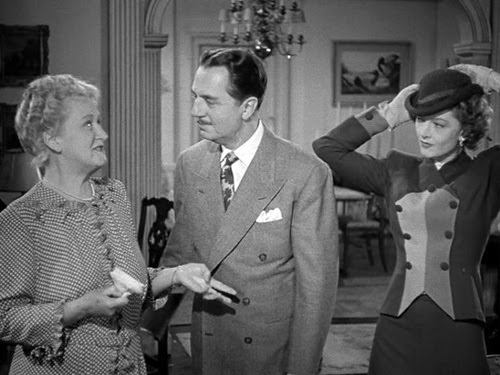 Then there’s screaming maid Hilda (Anita Sharp-Bolster) and Crazy Mary (Anne Revere) with her yen for bashing people on the back of the head. But we want a few hard-boiled types to add some bite to the proceedings. Threatening Nick’s dad with blocking his proposed hospital (he’s a doctor who wishes Nick had taken up the profession) doesn’t really do it. So when a couple of Nick’s dubious associates show up for the finale, and can’t get any hooch (“Cocoa? What a break!”) there’s a definite sense that Nick’s vacation ought to be coming to an end soon. Asta has been refurbished, in that he’s a different Asta. The original pooch was retired and an energetic newcomer takes his place with a few interesting tricks up his furry sleeve. 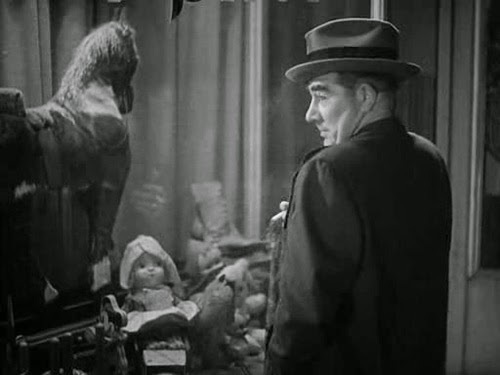 His encounters in the animal compartment of the train vary from amusingly cartoonish (the fake duck that pecks him) to the rather unnecessarily harsh (repeatedly being head-butted by a real goat). But as usual he provides invaluable aid in solving the mystery (finding the missing item, he is told “Astor, you’ll get an extra bone for this”). He drinks a good measure of Nick’s cider but the expected drunk doggy scene fails to materialise. Most impressively Asta launches onto a hotel’s hatcheck counter like he calls it home. 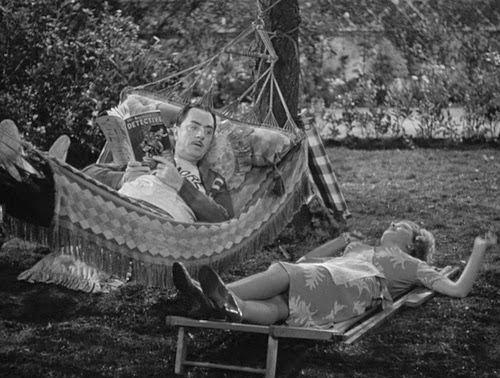 This a perfectly amiable Thin Man outing, coasting somewhat on the charm of its leads and as diluted as Nick’s liqueur. 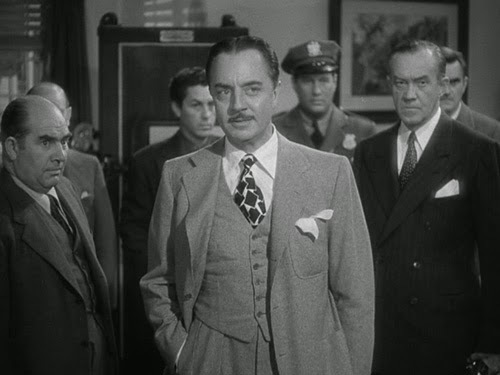 Richard Thorpe, who wasn’t much of a noir man, or any kind of style-maker, directs with a brighter, less fettered look than in earlier adventures, although its debatable if the change is to the ultimate benefit of its increasingly sober lead character. 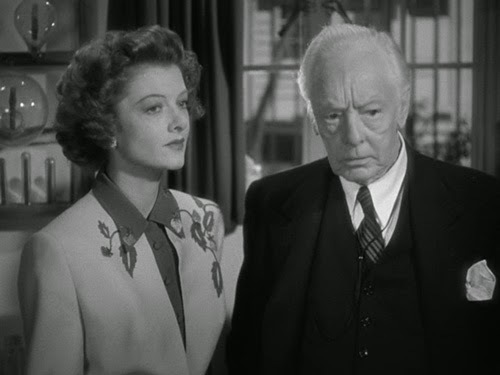 Two years later, and thirteen years after the series had begun, the series would end with the (swan) Song of the Thin Man. Which at least goes to show that erratic and long running movie series are nothing new. Maintaining this kind of quality over such a period is a rarity, though.